is the Clinical Director at the San Fernando clinic having moved here from our Westlake Village office. He has a vast array of orthopedic experience treating spine, upper and lower extremities as well as experience treating cases of plantar fasciitis. Mr. Young is ASTYM certified for the treatment of muscle and tendon acute and chronic issues. 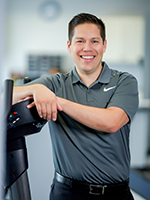 Mr. Young received his bachelor’s degree in kinesiology and his master’s degree in physical therapy from California State University, Northridge. He has also completed additional educational courses in spine rehabilitation. Prior to coming to Vargo PT he worked as a - sports physical therapist intern with the Los Angeles Dodgers where he helped to diagnose and treat extensive acute injury management and baseball-specific rehabilitation. A triathlete himself, Mr. Young completed the Arizona Ironman. He is an active member of the South Coast Triathlon Club. You will often find him treating fellow athletes from the club as well as from local premier high school athletic programs. In addition to endurance athletics, he enjoys golf, baseball, outdoor activities and spending time with his family.